When we think of urban living, the image is no longer one of suburban "quarter acre blocks" of the 60's and 70's, but of images of balconies, courtyards and roof top gardens within higher density housing communities that are so much part of new residential living preferences. However that does not mean that we cannot enjoy a garden. Today's urban development principles respect the societal need for outdoor green space, and it is a consumer necessity that landscaping design is such a pivotal part of the integrated approach to new and re-gentrified housing developments. What has also changed is the challenges of garden design. Smaller spaces maybe less expensive, but we place more demands on them. They are all too often required to multi task, which if designed correctly, do become exciting and highly functional places to enjoy. Like to know more about today's garden styles? So what are the some of the best garden ideas for urban living? DESIGN - To make efficient use of limited space, the more resources put to the planning of the space will result in a more functional space with aesthetic appeal and the sensory experiences that we have come to expect from great garden design. Plan, plan and plan before you turn the first sod of soil. ESTABLISH RELATIONSHIPS - With smaller garden spaces designed with adjacency to indoor rooms, there is an opportunity for greater intimacy between the two areas. Commonality of theme and complementary colors and texture will ensure that each space offers collective balance, serenity and composure. In this example the terracotta pots in the courtyard are in absolute harmony with the weathered feature floor inside. Natural elements are used to perfection here. CONNECTING DOORS - If the budget is reasonable, allow the architecture of the connecting doors to greatly enhance the relationship between the two spaces. The doors are the physical connection, and if they are both stylish and functional, they become an added element to collective spaces. The larger the window/door opening, the greater the relationship. In this case the doors allow the garden to feature as an integral part of the home, and bid you to engage with the garden. MAKE IT SPACIOUS - It is always a good idea to design a small room to feel larger. It is the same with an outdoor garden room. Allow as much natural light as possible and use muted or natural colors for the hard elements, particularly the walls. If your design can incorporate one or two different floor levels then all of a sudden the space feels larger and more interesting. Remember not to clutter the space. NATURAL ELEMENTS - Gardens are the place of interaction between nature and people. Where possible encourage the garden design to include natural products like wood or stone. Together with plants, natural elements bring us much closer to nature and are an amazing therapeutic contributor to our sense of well being. WHICH PLANTS - Plants bring life to the garden, they are the living, breathing organisms that attract flora and fauna whilst purifying the air. They provide year round interest to a garden whereas flowers have a seasonal time span. Choose the right combination of plants can provide a layering effect with different textures, leaf shapes, heights and colors for year round interest. Naturally your choice will be influenced by the micro climate of the space. You should also be mindful of the size of the plants at maturity. POTS ARE A PLUS - For a balcony there is no choice but to use pots, but I would also suggest you use them in an on ground courtyard garden. They are just so versatile, they add decor to the garden, they can be used as a water feature, and they allow you to create an instant garden with optimum size plants. For pure decor interest, sometimes it is best to leave them as a feature piece without a plant. LIVING WALL - When space is at a minimum, plant against the wall. You can either allow a climber to grow up the wall, or install vertical garden technology facilitating many various plants. If the variety of plant is your preference, then be prepared for a little more work. Either way, place the living wall in the direction that you most look at. In this example Trachelospermum jasminoides climbs a framed trellis creating both a green wall with structural interest as it subdues the outer wall. BRING PLANTS INSIDE - The trend for indoor plants is back, so you will be fashionable with an indoor plant or two. The choice of plant will determine whether it is against or away from the window, but if the plants are generally en route to the garden, there will be a greater relationship between indoor and outdoor. LIGHTING - Australian weather allows us make the most of our gardens during the evenings for most of the year. 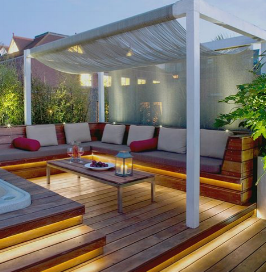 Careful placement of lighting to accentuate garden features and special plants, gives the garden room a special ambience or personality to enjoy over a longer timeframe. A HIGHER LEVEL - Should the architecture permit it, placing elements of the garden up on another level adds another dimension to it. For instance if a small balcony could be added to an upstairs window (that overlooks the garden) upon which were some potted plants, the scale of the garden changes dramatically. This garden has a vertical plane, which provides balance to the horizontal plane. SHADING - Chances are the surrounding buildings to your space will provide full shade for or full sun for different parts of the day. To reduce and soften that impact, small trees will provide a subtle transition from full sun to full shade. As the weather becomes more extreme, shaded environments reduce the ambient temperature of our space and enhances our well being. To maximise the usable space under the tree, allow the tree canopy to be high on the trunk - referred to as crown lifting. PRIVACY - Your private outdoor haven is not so private if neighbouring windows look down upon you. Bamboo can be a great solution for privacy, particularly Slender Weaver Bamboo. It is non invasive, grows quickly and if correctly maintained (easy), will give you layers of vertical greenery all year. Bamboo does not take too much ground space, and for balconies, can be grown in pots. FURNITURE - The choice of garden furniture can have a huge impact on garden style. It needs to be easy to use and to keep clean, whilst visually appealing and complementary to the overall garden. Slim line furniture in this example does not obscure the garden view. Use furniture that is suitable for indoor and outdoor use, such that the integration between each space is enhanced immediately. Fabric has become such an essential part of the personality of the urban garden, be it cushions or umbrellas, and it is where you can really put your stamp on the garden's ambience. COLOR - Finally, for added garden styling, paint a single pot, or a single seat, or a single box etc in a color that highlights the overall personality of the garden, but also pays respect to the decor inside the adjacent room. If you need some guidance, feel free to make contact and let's chat - I would love to help.